The Russian Ministry of Defense has released video footage showing its nighttime cruise missile strikes from the Caspian Sea against Islamic State targets in Syria. 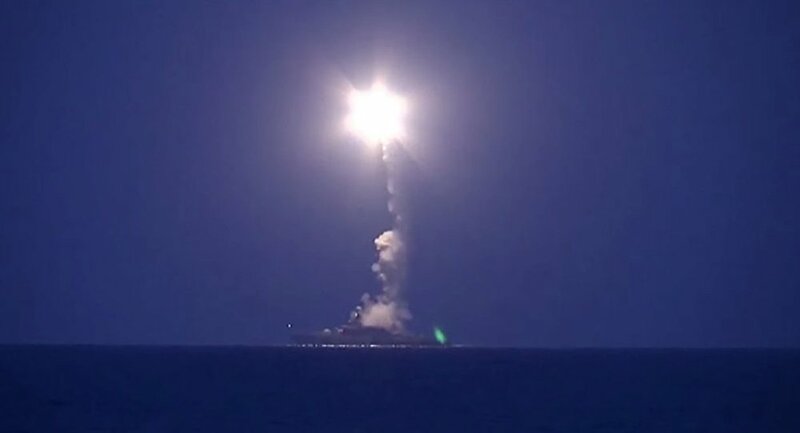 The assembled footage features video and animation of Russian ships launching cruise missile strikes against Islamic State targets from the Caspian Sea. The video combines computer-generated imagery showing the cruise missiles' trajectory with footage of the missiles flying over western Iran and northern Iraq before arriving at their targets in northern Syria. Earlier on Wednesday, Defense Minister Sergei Shoigu confirmed that four Russian destroyers had launched 26 Kalibr-class sea-based cruise missiles at 11 targets. All the targets were reported to have been destroyed. "The fact that we launched high-precision missiles from the Caspian Sea at approximately 1,500 kilometers [932 miles] and hit all of the targets says much about the good training in the military-industrial complex and good skills of the staff," Shoigu noted, speaking at a meeting with Russian president Putin. On September 30, Russia began airstrikes on ISIL in Syria following Syrian President Bashar Assad's request for military assistance.